Over time my opinion of people and how we all get on have changed. Not everyone in this world is going to like you. No matter what you do, how reasonable you are, the number of olive branches you offer, some people are just never going to like you. That bit I learnt early at school when Nigel was leading the bullies. Each one of them I could manage on their own, negotiate some peace, but not Nigel. Over time I realised it’s just a reality: some people will not like you and there is no discernible reason. And it can be a very passive dislike – no anger, no hate, just a total absence of like rather than actual dislike I guess. You are not going to like everyone. This is not a case of you needing to be a better person or some sort of saint, I don’t think I’ve met anyone yet who likes everyone. Some people respect everyone, have time for everyone, will try to think the best of everyone. But not like. I did not like Nigel, for good reason, but there are other people who I do not like who have never done anything bad to me. Again, it is not that I dislike them, I’m just indifferent or mildly irritated by them. For many years through my 20’s and 30’s I thought I should try and alter that – but I failed. I just don’t like some people. It’s OK and Normal that some people you will just not get on with. I struggled with that for years. Surely, so long as someone is not psychotic or just simply a bad person, bridges can be built? When I started thinking more about teams, managing people, getting people to work together, I did learn more about how to identify the reasons for bad feeling and resolve them. I had more success at it than I thought I would, and acknowledging that half the time it was my fault not theirs helped. But with some people, no it was not happening, we did not like each other. But things could usually be improved – if not bridge-building, then at least waving politely at each other from our respective sides of the river. 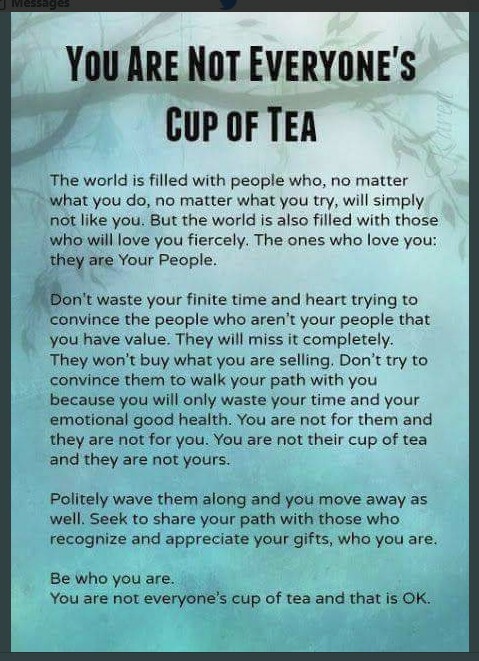 That led me to what I felt was the final part of being someone’s cup of tea. I like tea with sugar and milk, some people think that is disgusting and, anyway, it should be green tea. They are wrong. But it does not matter. If they want a cup of tea, I’ll make them a cup of green tea. Not getting on with someone is not a problem – so long as you don’t MAKE it a problem. If you don’t like someone there is no need for you to make them “The Enemy”. If you do, well you just made an enemy and that person is likely to be obstructive to you, retaliate and generally make life less nice. And that will spill over to others around you. Oh, I’m not a saint, I try to apply this rule to myself but I don’t always pull it off. I’m not wise enough to know all the reasons we do not all get on but I think sometimes the reasons are just not important. I might remind you of someone you really detest, I might find the way you keep singing bits of “The Smiths” an affront to good musical taste. And even if there are reasons that seem good, the less antagonistic you can keep it, the better. And I repeat, sometimes it is not active dislike, it is just an absence of like. The context is also a factor in this. In a social situation, if you do not get on with someone it’s easiest just to avoid them. And we all do this. But you don’t need to try and make everyone else dislike them. In a work or family situation it can be harder as you have to deal with people you don’t like. I think that acknowledging that you just don’t get on and it happens, no blame either side, makes it easy to be equitable about it. It seems to me that the people I do not get on with have a different life philosophy to me and the larger the difference, the larger the chance of dislike. I don’t like Right Wing conservatives. I don’t like selfish people. To them I am probably sanctimonious, deluded and borderline communist – which is not fair, I AM communist. In that I think our community is the most important thing about being human. But I also use humour a lot and that really annoys some people as I use it in inappropriate settings or they do not think I am taking issues seriously enough or professionally enough. And they may be right. So, all very good and very grown-up of me so far. Now for my final point. Some people are just not nice. We’ve all met them, the person who no one can get on with as they are so self-opinionated, bullying, harsh, self-serving. And any attempt to build bridges with them is either seen as weakness or used as a way to get you on-side before they hang you out to dry. 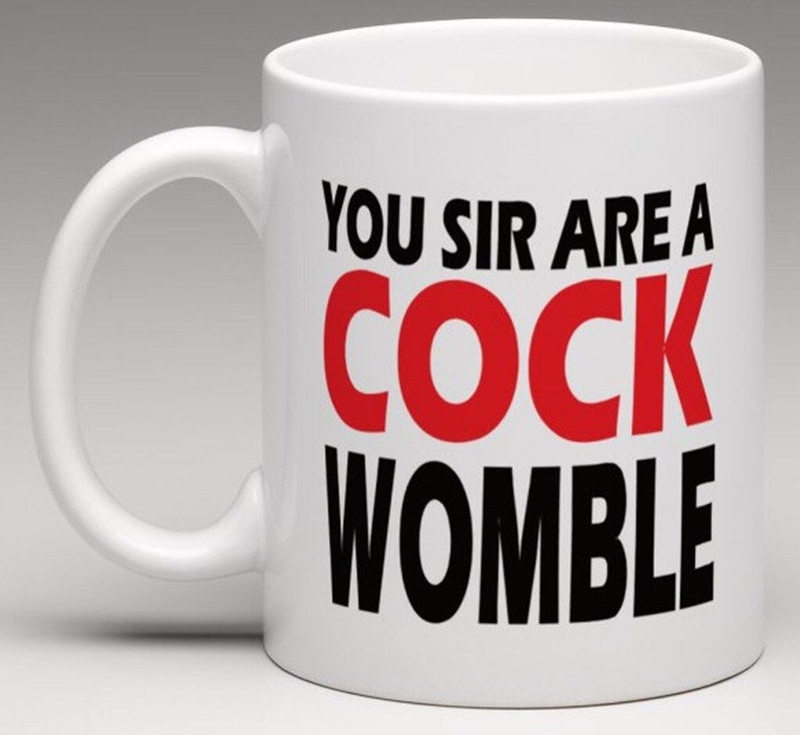 Is this just an extreme case of not being your cup of tea? Well, maybe, but I don’t think that. Some people are just not worth the trouble. And some people are trouble. It comes back to Condoning Bad Behaviour. I actually decided that some people are not nice (and probably never will be) long before I came to the conclusion about it being OK to not get on and trying to not make it a problem. At that point I wondered if that would be the whole solution, just accept that you do not get on and let it lie. But I kept hitting up against the occasional person who, no matter how much you tried to not make it a problem, they did make it a problem. And they continued to bully, oppress, be antagonistic – and they got away with it. With these people I still try and walk away. And if I cannot? I don’t condone bad behaviour. I’ll tell them what I think and, if I can, I’ll stand against them. It is not easy though as they are like Nigel. They surround themselves with similar people or stooges they can direct. Now that is a totally different issue. I think it’s right to try and be friends with everyone. But you won’t be friends with everyone so strive for peace with the others. And if peace is difficult, distance should work. But I will not condone bad behaviour, OK?